LP Police Announces The Latest Unified Database that Enables Law Enforcement to Locate People of Interest, Link the Most Relevant Information and Find Suspects Faster. Take advantage of the latest technology for advanced investigation options on live enhanced search that give police the ability to customize any search resulting in the highest level of flexibility. LP Police works directly with police departments and government agencies to implement budget friendly plans by analyzing their investigative database/software requirements and recommending the most effective program to meet their needs. LP Police works directly with police departments and government agencies to implement budget friendly plans by analyzing their investigative database/software requirements and recommending the most effective program to meet their needs. 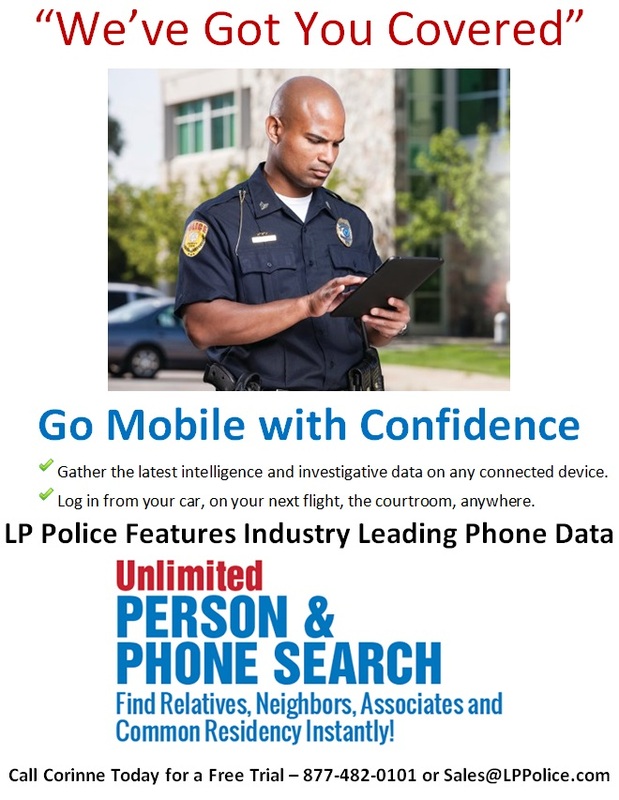 LP Police, America's #1 person, cell Phone search and Investigative software for Government & Law Enforcement announces the latest unified database for leveraging over 40 free searches, 99% of phones in the U.S., a subjects’ identity, people of interest, credit header phone data, and much more. Police and Law enforcement agencies can now locate affiliations, people, relatives, neighbors, businesses, associates and common residency instantly with the most reliable data feeds and easy to use investigative software tools. Complex investigations are now solved with the ability to connect to current and historical data in real time. Start searching with a name, alias, social security number or partial information. LP Police can uncover hidden relationships and persons of interest by employing the latest data retrieval technologies and link analysis software for locating individuals, assets and relationships quickly and easily. A completely redesigned and easy to use interface sets the standard for fast and accurate searches & reports. All of the searches have been restructured to provide users with the most sought after information. Searches include a broad range of categories, comprised of over 40+ searches law enforcement professionals are looking for. A new, all-inclusive report now contains over two dozen data points on a subject, so all of the information is in one place. Access gun permits, hunting licenses, priors and more. LP Police helps to make investigations safer! LP Police is committed to constant improvement and innovation. An ongoing program of law enforcement focus groups has been put in place to perfect a user’s experience. Subscribers can now search all of the historical and current records to ensure the fastest and most accurate information every time. Police and government agencies can benefit from superior data and fast data access when it counts. Quick Tip sections on the top of every page, coupled with VIP support, assist investigators through every step of a search. Homeland Security, Police Departments, Drug Task-forces, Constables, Sheriffs, and US Marshals will uncover persons of interest with ease. Find relatives, neighbors, associates, and common residency instantly with the latest link analysis tools. Once a person of interest is identified, the data is organized and accessible. Because relationships are often vital to solving a case, investigators may need to dig deeper and find a subject’s 3rd and 4th degree. LP Police quickly provides all the investigative pieces needed to solve more cases. The search results include full SSNs, DOBs, MVR, people, assets, licenses, court records (criminal/civil), phones, prior residences, real estate holdings, recorded bankruptcies, liens, judgments, businesses and more in a secure, interactive, searchable database. Law enforcement and government agencies (federal, state and local) are encouraged to experience the superior data, accuracy and world class free “VIP” technical support and customer service from LP Police. LP Police provides subscribers with all the pieces needed to “Connect the Dots” and solve more cases. 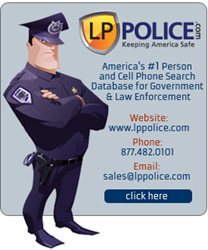 The LP Police proprietary online skip tracing database can be used wherever there is an Internet connection, whether in an office or on a mobile smartphone or tablet device. 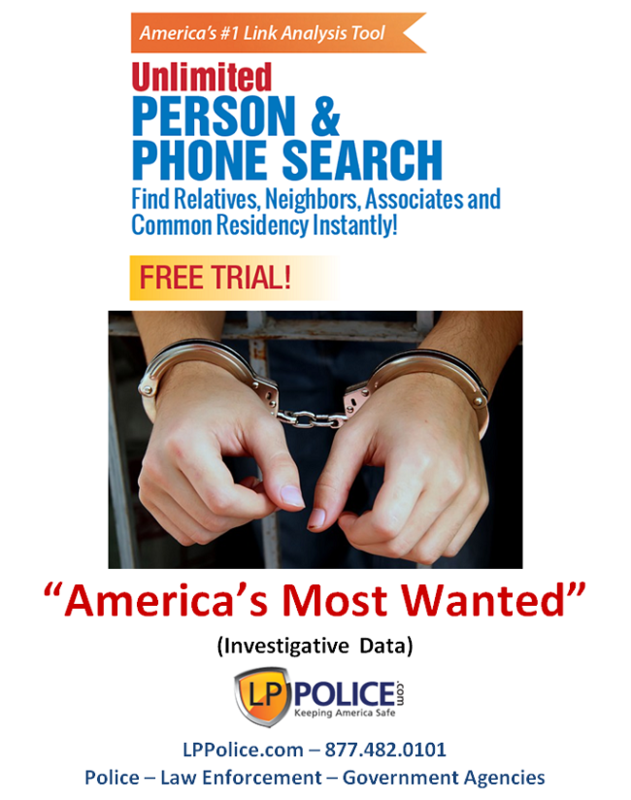 Subscribers have instant access to America’s #1 person and cell phone search. Law enforcement benefits from billions of updated online public records to conduct person, phone, address, email, social security, civil records, criminal background, property, assets, licenses and motor vehicle searches. LP Police - "Catch the Bad Guys"
"America's Most Wanted"LP Police "We've Got You Covered"